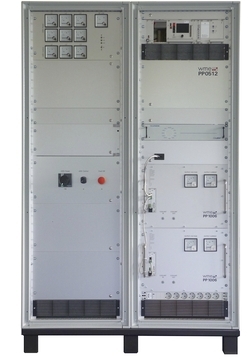 PA1025P is a highly stable pulsed magnet power supply unit that is used to feed the chicane dipole magnets of the cooler synchrotron COSY at FZ Jülich. Based on a linear, air cooled pulse amplifier, the power supply provides output currents of 0 to 250AP at output voltages of up to 100VP. The polarity of the pulses can be selected. Typical pulse timing is in the range of 1ms to 100ms. 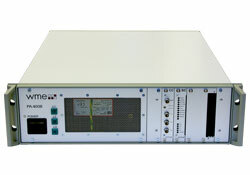 PA20100 is an ultra stable magnet power supply that feeds the quadrupole magnets of the PTB Metrology Light Source in Berlin. It facilitates output currents of up to 100 A with a stability of ±10 ppm or better and allows for output voltages of up to 20 V.
PA2540 is an extremely stable 4-quadrant magnet power supply. It is used to feed various magnets of the storage rings of BESSY II and PTB Metrology Light Source in Berlin. It is based on a linear, water-cooled power amplifier and allows for output currents of ±40 A at output voltages of ±25 V. PA2540 also features excellent stability and low ripple and noise. A separate analog modulation input is provided that allows for very fast output current control. This setpoint is independent from the control system setpoints. 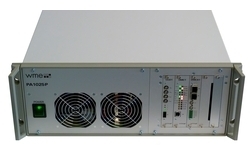 PA4008 is an extremly stable 4-quadrant magnet power supply that feeds various magnets of the storage rings of BESSY II and the PTB Metrology Light Source in Berlin. It is based on a linear, air-cooled power amplifier and allows for output currents of ±8 A at output voltages of ±40 V. PA4008 features excellent stability and low ripple and noise. A separate analog modulation input is provided that allows for very fast output current control. This setpoint is independent from the control system setpoints. PP0512 is a magnet power supply unit that will be used to feed the chicane dipole magnets of the High Energy Storage Ring for Antiprotons HESR at the Facility for Antiproton and Ion Research FAIR in Darmstadt. 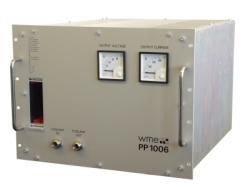 The water-cooled power supply provides output currents of up to 1100A at output voltages of up to 50V. It consists of a transformer/rectifier/filter unit and a consecutive DC/DC converter power part including protection and supervision circuits. The 4-phase step down DC/DC converter features excellent efficiency > 97% at high load voltages. High efficiency and water-cooling leads to low operating temperatures within the system racks. The 4-phase power stage concept results in very low output ripple. A high precision DCCT is integrated into the unit. Das PP1006 ist eine Magnetstromversorgung, die dazu dient Quadrupolmagneten des Speicherrings PETRA III bei DESY in Hamburg zu versorgen. Es liefert Ausgangsströme von bis zu 600 A bei Ausgangsspannungen von mehr als 50 V. Das System ist wassgekühlt und arbeitet äußerst effizient.